Ebihara et al. 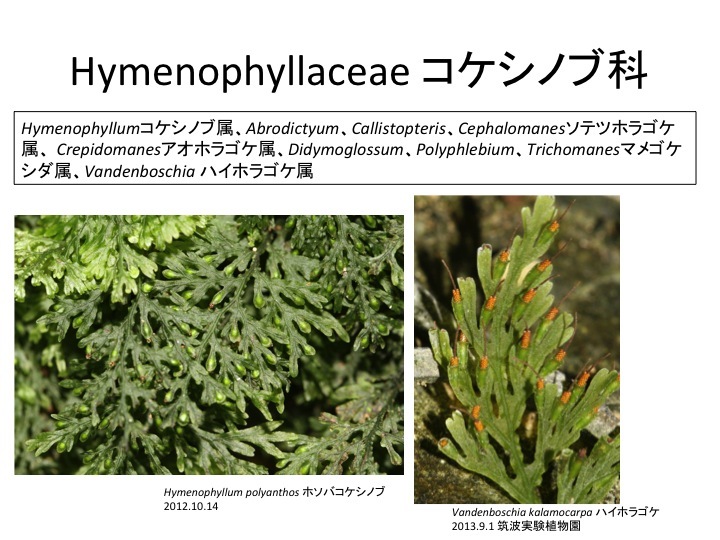 (2006) A taxonomic revision of Hymenophyllaceae. Blumea 51: 221-280. How is the difference between bivalvate and cup-shaped involucres formed? Iwatsuki (1977) observed their development and showed that spatiotemporal difference of cell division activity caused the different morphology. 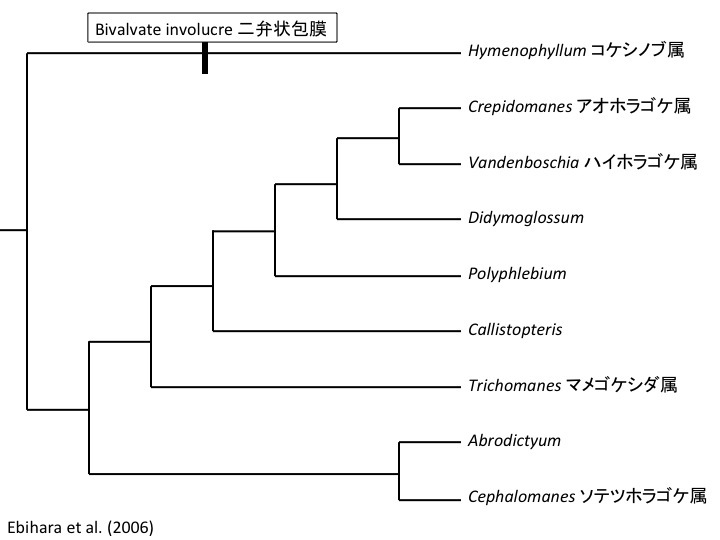 When we know the molecular mechanisms to regulate such cell division patterns, we will get a part of the answer on the evolution of involucre divergence in the Hymenophyllaceae. Regulatory mechanisms of spatiotemporal cell division activity is fundamental question in developmental biology and morphology but we do not have clear answers. In angiosperms, the border between adaxial and abaxial domains have division activity (Waites and Hudson 1995) and WOX is involved (Nakata et al. 2012). However, mechanisms to regulate spatiotemporal activity regulation in the border is not well known. By the way, a compound leaf is formed differential division activity in a leaf primordium and the involvement of auxin (Bilsborough et al. 2011) and transcription factors (Vlad et al. 2014) have been reported. Here we need to remember that a leaf of most filmy ferns is a single layer of cells. It is curious how they determine the adaxial and abaxial sides as well as the spatiotemporal division activity. This is similar in mosses. 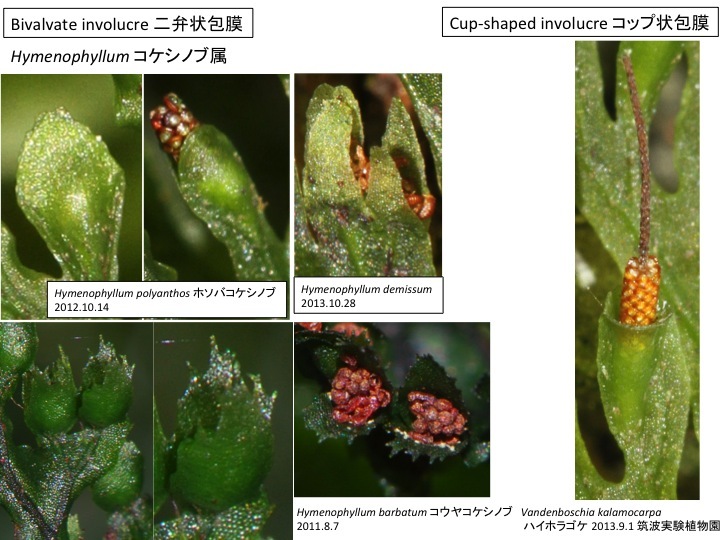 In the moss Physcomitrella patens, we found a transcription factor to regulate spatiotemporal cell division activity in a leaf and the study may be a breakthrough for understanding the leaf shape evolution and may be able to explain the diversity of involucres in the Hymenophyllaceae. Bilsborough, G.D., Runions, A., Barkoulas, M., Jenkins, H.W., Hasson, A., Galinha, C., Laufs, P., Hay, A., Prusinkiewicz, P., Tsiantis, M. (2011) Model for the regulation of Arabidopsis thaliana leaf margin development. Proc. Natl. Acad. Sci. USA 108: 3424-3429. Iwatsuki, K. (1977) Studies in the systematics of filmy ferns III. An observation on the involucres. Bot. Mag. Tokyo 90: 259-267. Nakata, M., Matsumoto, N., Tsugeki, R., Rikirsch, E., Laux, T., Okada, K. (2012) Roles of the middle domain-specific WUSCHEL-RELATED HOMEOBOX genes in early development of leaves in Arabidopsis. Plant Cell 24: 519–535. Vlad, D., Kierzkowski, D., Rast, M.I., Vuolo, F., Dello Ioio, R., Galinha, C., Gan, X., Hajheidari, M., Hay, A., Smith, R.S., et al. (2014). Leaf shape evolution through duplication, regulatory diversification, and loss of a homeobox gene. Science 343: 780-783. Waites, R. and Hudson, A. (1995) phantastica: a gene required for dorsoventrality of leaves in Antirrhinum majus. Development 121: 2143-2154.